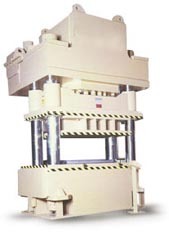 When hydraulic shock dampers are properly utilized in a press, tool life can be extended by 3 to 5 times. The tight tooling punch and die shear clearances required for optimal edge quality requires close gib-guiding throughout the stroke. At the moment of fracture severe off center loading is developed that can cause punch/die contact wear or breakage. Shock dampers capture the break through energy, reducing tooling misalignment, tool wear and damage.